While impact events identify specific mapped suppliers that are in the geographic zone potentially impacted, it’s important to point out that all events from EventWatch represent potential impacts. For example, a Protest/Riot or Hurricane/Typhoon/Cyclone event could cause delays at regional ports and airports that would disrupt supply chains—even if no supplier sites are mapped to the zone of impact. Volcano eruptions can impact air traffic control. A Shutdown/Explosion at a Mine could impact raw material shipments. EventWatch Impact notifications are issued when a supplier site or sites may be directly affected by a disruptive event. In these cases, customers receive an additional EventWatch Impact notification summarizing the supplier sites in the affected region, the number of parts originating from affected sites, a list of part categories, number of products, revenue and average time to recovery. EventWatch impact events are not always confirmations of a specified disruption but are confirmations of events that have the potential to disrupt supplier(s) site(s) directly. In 2018, of the 2,629 events issued by EventWatch, 907 of them required an Impact notification due to supplier site(s) being potentially disrupted. Almost 35% of the events observed in 2018 required an impact assessment by Resilinc customers. This is a noticeable increase from 2017, where 562 Impact notifications were triggered by 1,931 events, which translates to 29% of the total. 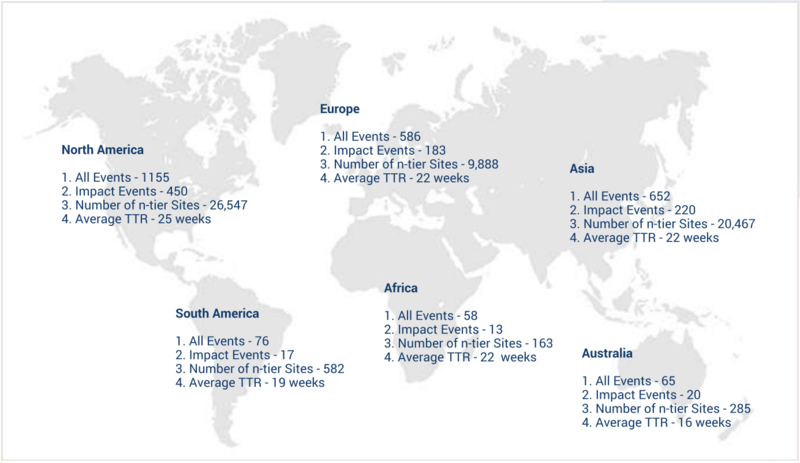 The chart above compares the number of impact events by region in 2017 and 2018. 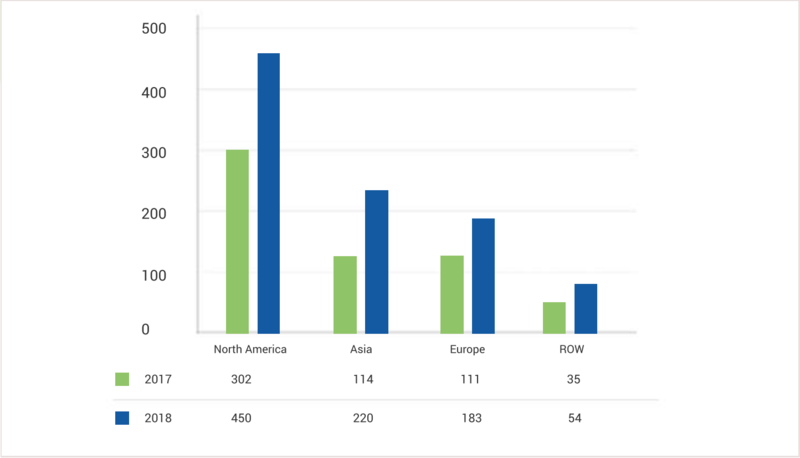 North America, Asia, Europe and Rest of the World (RoW) experienced increases in the number of events that required impact assessment in 2018 while maintaining their first, second, third, and fourth positions respectively from 2017.